LectureHub » What is CRISPR/cas9? CRISPR/cas9 is a defense mechanism used by certain bacteria to protect themselves against viral (bacteriophage) attach (see figure below). The most commonly used CRISPR/Cas9 bacteria system comes from the bacteria Streptococcus pyogenes. Essentially as the bacteria is exposed to viruses it keeps portions of the viral genetic code (in the form of short RNA sequences) around so it can recognise the virus again. The CRISPR system keeps a record of the viral genetic code and the cas9 enzyme does the cutting. 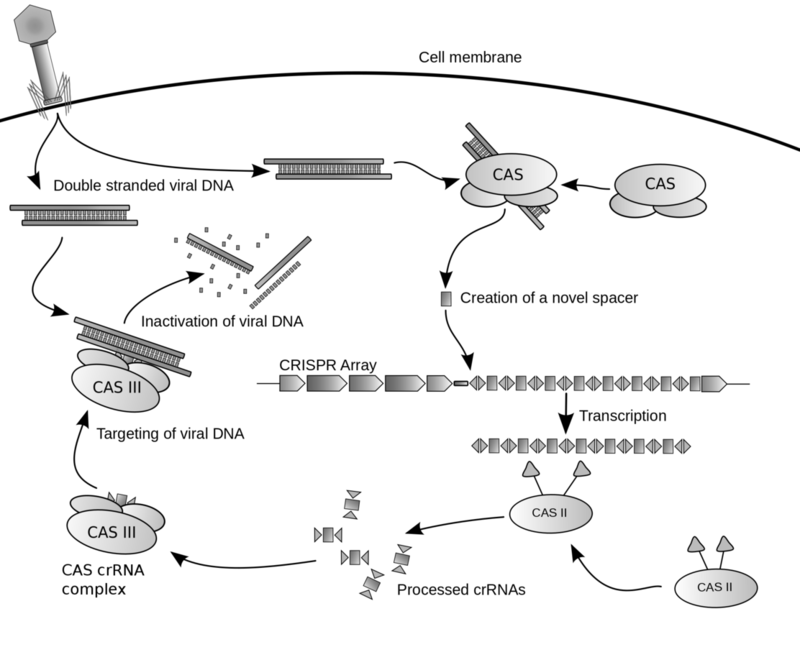 If the CRISPR/cas9 system encounters a virus it recognises in the bacterium the cas9 enzymes chop up the viral DNA preventing the virus from replication. What’s so interesting about this? Well scientists have been able to extract this system from bacteria and use it to quickly and efficiently create transgenic organisms. The system allows for much more precise modification of a genome then traditional methods. Traditional methods of producing transgenic animals has involved injecting genetic material into embryos and hoping for homologous recombination. This technique not only had plenty of failures but also many non specific effects through in correct targeting of the sequence that the scientist wants altered. A successful transgenic animal could take up to a year to produce. With CRISPR/cas9 specificity this can be shortened to as little as 12 weeks. Below are some articles/papers explaining the system.